Daedric weapons and heavy armor are the best quality standard items available in the game. This page documents standard Daedric armor and weapons; the unique Daedric Artifacts obtained by completing Daedric Quests are documented on the Artifacts page. Daedric items are made out of ebony, using identical materials to the equivalent ebony items in addition to a Daedra Heart. The heart imbues the items with the essence of the slain Daedra, as described in Heavy Armor Forging. Daedric Smithing is the fourth perk in the heavy armor branch of the smithing skill's perk tree. Unlocking it requires a smithing skill of 90 and the Ebony Smithing perk. Although Daedric armor is more effective than Dragonplate, the Daedric Smithing perk can be unlocked before the Dragon Smithing perk (which also allows for the creation of Dragonscale light armor). The Daedric Smithing perk also causes tempering of Daedric weapons and armor to be twice as effective. This perk applies to both unenchanted Daedric gear and enchanted gear (generic armor, generic weapons, or custom gear), as long as the Arcane Blacksmith perk has been unlocked. Tempering of several other items is also improved by Daedric Smithing, namely all Dragon Priest Masks and all Ancient Nord armor. Obtaining a Daedra Heart is often the most difficult step in crafting Daedric gear; the Daedra Heart article provides full details on how they can be obtained. Daedric weapons and armor can also be created at the Atronach Forge. Although using the Atronach Forge allows these items to be made without investing in multiple smithing perks, obtaining the necessary materials can be more difficult. In addition to the equivalent ebony item and a Daedra Heart, you need to supply a centurion dynamo core and a black soul gem — as well as having upgraded the forge with a sigil stone, which can only be done once your conjuration skill reaches 90. Also note that the Atronach Forge cannot be used to create Daedric Boots (the boots are bugged). However, the availability of all the ingredients still makes this a viable option for players not wishing to spend valuable skill points on the Daedric Smithing perk. The tempering bonuses, however, means that a player with the perk will see far greater benefits from the equipment. 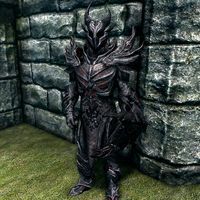 Daedric Armor, even with Dawnguard and Dragonborn included, is the best heavy armor in the game. It appears in leveled lists starting at level 48 (enchanted varieties at level 49). However, even after level 48, Daedric armor is twenty times less likely to appear than other armor types. All items can be tempered using 1 Ebony Ingot. Daedric weapons are the best standard weapons available in the original release of the game. The Dawnguard add-on introduces Dragonbone weapons, which exceed Daedric in quality. They appear in leveled lists starting at level 46 (enchanted varieties at level 47). However, even after level 46, Daedric weapons are twenty times less likely to appear than other weapon types. All items except ammunition can be tempered using 1 ebony ingot. Arrows can only be created if the Dawnguard add-on has been installed. Although most Daedric weapons are superior to their ebony equivalents, the Daedric Mace and Daedric War Axe actually do the same amount of damage as the ebony versions. Given that the Daedric versions weigh more and require a valuable Daedra Heart, some may prefer to use the ebony versions instead. † The base gold value used for all generic enchanted versions of the Daedric Bow is 875 instead of 2500. This means that the enchanted weapons are 1625 gold cheaper than they should be, and in several cases are cheaper than the unenchanted bow. This bug is shared by several types of bow in the game. This bug is fixed by version 1.3.1 of the Unofficial Skyrim Patch. Dremora also wear a variety of Daedric armor (see Dremora equipment) which you can neither loot nor equip. At the Skyforge, ancient Nord armor will also be listed in the Daedric section of the forging menu, and tempering of ancient Nord armor is also improved by the Daedric Smithing perk. However, ancient Nord armor is not otherwise considered to be Daedric armor. This issue has been addressed by version 1.2.7 of the Unofficial Skyrim Patch; it is listed in the Steel section of the forging menu instead. Keeper Carcette and other generic Vigilants of Stendarr can sometimes be found carrying Daedric weapons, despite it being against their beliefs, however, it is implied that they are only carrying them to destroy or store them at a later date. 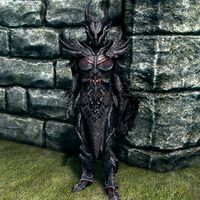 This issue has been addressed by version 1.2.6 of the Unofficial Skyrim Patch; they will only carry non-Daedric weapons. If you temper a Daedric bow to legendary quality and then enchant it, its base damage may revert to a base Daedric bow. This page was last modified on 22 November 2018, at 03:46.